NOAA debunks the hysteria about this El Niño. Why don’t we listen? The title of NOAA’s latest report about this El Niño gently mocks the hype about its effects (e.g., a “Godzilla El Niño”, destroyer of cites). The text debunks exaggerations about it being the greatest ever. So far this El Nino matches NOAA’s prediction that it would be among the three strongest on record (i.e., in the 65 years back to 1950). This is another of NOAA’s well-written articles that put the El Niño into its proper historical context as a normal weather event. As usual these days, activists and their journalist fans often ignore what NOAA says (just as they do with the reports by the IPCC) in favor of exaggerations and wild predictions. I recommend that you read the full essay. Here are some of the high points. Red emphasis added. If you’ve been following the development of this El Niño, you may have heard in the media that sea surface temperatures in the central equatorial Pacific are at near-record highs. Are we seeing the most powerful El Niño ever? … The important effects of El Niño on the U.S. and other regions are related to its average strength over the fall and winter, not how strong it is on any particular day or week. We do monitor the weekly and monthly changes in the sea surface temperature and the atmosphere to get a hint at where things are headed, but we’ll ultimately judge the strength of this El Niño by its average over the seasons. The Niño3.4 ERSSTv4 for September–November is 2.04°C, second to 1997’s 2.18°C. Since we’re looking at this El Niño very likely placing in the top three (with 1997-98 and 1982-83), let’s compare some of the other components of the system right now. I’m going to focus on 1997-98, since by most assessments that’s the strongest El Niño in our short, 1950-present record. 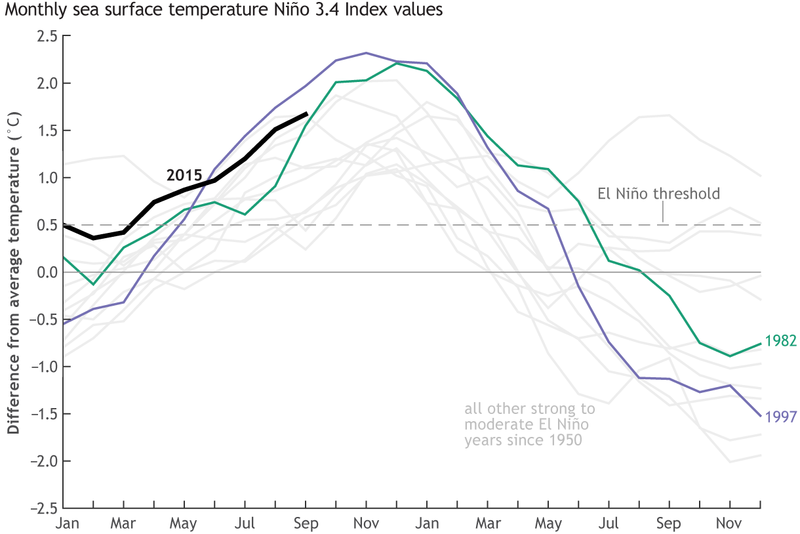 Monthly sea surface temperature in the Niño 3.4 region of the tropical Pacific compared to the long-term average for all moderate-to-strong El Niño years since 1950, showing how 2015 (black line) compares to other strong events. … If you average the September – November low-level winds over the central Pacific, you get about 8 miles per hour, trailing 1982 (1.5 mph) and 1997 (-2.5 mph) pretty substantially (positive numbers means the wind is blowing from east to west, and negative means west to east). The average wind speed of the trade winds this time of year is about 16 miles per hour. Another measurement of the atmospheric response to El Niño’s warmer waters is the Equatorial Southern Oscillation: November 2015 is currently third, behind 1997 and 1982. While we’ve seen consistently more clouds than normal over the tropical Pacific this year (evidence of increased convection due to the warm water), this response has also been less than it was in 1997 over the central to eastern Pacific. From Australia’s Bureau of Meteorology. Every El Niño event is different, and even if there are some strong similarities between this El Niño and another, we’d be really surprised if everything lined up exactly the same. By most measures, this is one of the top three strongest El Niños since 1950, and there’s still a chance it could record the highest Oceanic Niño Index (the three-month-mean sea surface temperature anomaly in the Niño3.4 region, our primary ENSO metric). But ocean temperatures are just one way to measure ENSO, which can be tracked in many ways. While the warmer-than-average ocean waters are likely reaching their peak about now, they will remain a huge source of warmth for the next several months to drive the main impacts on temperature and rain/snow over North America, which typically follow the peak. The main impacts season is December–March, so we’re just at the very beginning of finding out what this El Niño event will bring to the U.S. There’s no doubt that El Niño 2015-2016, which has already shown its power around the world, will have a significant effect on the U.S. winter. It’s going to be a very interesting “horse race” among the 3 events. I agree that the 1997-98 will probably retain its number one rank. As for beating 1982-83 or not, it’s going to be close! In terms of the ERSSTv4 SST data, we are currently running just a bit ahead of 1982-83, but in 1982-83 the SST slightly increased more for December, and stayed nearly as warm in January (using just 1-month average ERSSTv4) than it might do this December and January. So I wouldn’t want to bet the farm either way, as fun as it might seem. … While most of the US has its strongest climate effects from ENSO during winter (December through mid-March), the West Coast’s impact tends to happen just a bit later in the season, even if the El Nino itself starts winding down. So I’m not at all surprised that so far, the pattern of dryer in the Pacific Northwest and wetter in southern California has not yet appeared in earnest. It’s possible that before that pattern does form, BOTH the southwest and northwest could receive alternating periods of pretty strong storm system passages. See Bob Tisdale’s December ENSO Update – “Shouldn’t Be Long Now Until the El Niño Starts to Decay”. Learning from 2014: Looks like yet another false alarm. Probably no super monster El Niño coming this year. Choose your facts: learn about the El Niño from journalists or activists. Prepare for a clickbait avalanche about the super El Niño! El Niño, The Media Star: Separating Hype from Probability — From the Browning World Climate Bulletin. Update on El Niño: will Gaia disappoint the climate activists? This El Niño is not Godzilla. What can we learn from the 2 years of hype? Previous Post Why is the Fed Talking up the Economy? The Answer Reveals Much. An important note about the margin of error for measurements of SST. By NOAA’s Anthony Barnston. It is a comment to their “December El Niño update“. Bold emphasis added. “The accuracy for a single SST-measuring thermometer is on the order of 0.1C. 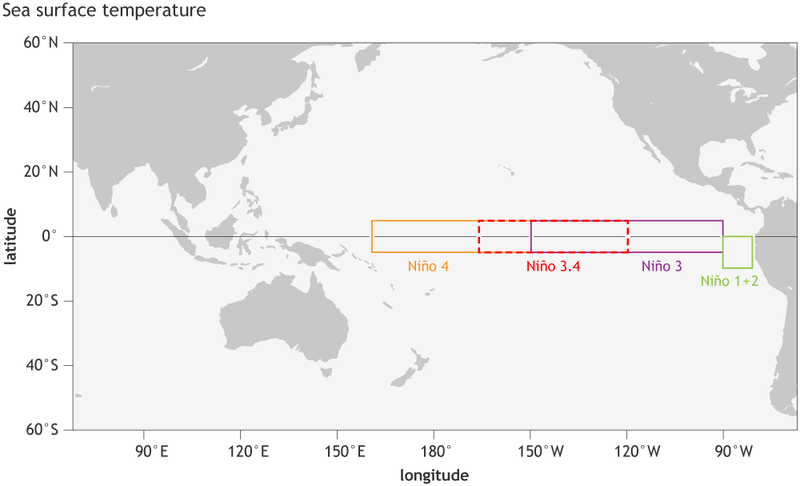 “… We’re trying to measure the Nino3.4 region, which extends over an enormous area. There are vast portions of that area where no measurements are taken directly (called in-situ). The uncertainty comes about because of these holes in coverage. Satellite measurements help tremendously with this problem. But they are not as reliable as in-situ measurements, because they are indirect (remote sensed) measurements. We’ve come a long way with them, but there are still biases that vary in space and from one day to another, and are partially unpredictable. These can cause errors of over a full degree in some cases. We hope that these errors cancel one another out, but it’s not always the case, because they are sometimes non-random, and large areas have the same direction of error (no cancellation). “Because of this problem of having large portions of the Nino3.4 area not measured directly, and relying on very helpful but far-from-perfect satellite measurements, the SST in the Nino3.4 region has a typical uncertainty of 0.3C or even more sometimes.